It’s time to look at the next Equestria Girls film. The first ones were pretty solid so I was confident that this one would be more of the same. It’s definitely another good installment. While I still miss the real Twilight, I suppose this version of the character is still reasonable. This movie has less action and intensity than the previous ones, but is able to focus more on the writing and emotional aspect of the characters. With quality writing throughout there really isn’t much to dislike here. The film starts with Twilight and the gang heading to a forest for summer camp. They’re all eager to participate in the various activities. They can finally feel like normal people again after their crazy magical adventures in the previous films. Unfortunately Twilight is having a tough time relaxing because her evil alter ego is determined not to let her succeed. At this point, she is out of options and starts to think that she may be doomed to plummet into the darkness. Sunset decides to help her, but meanwhile the Mane 6 are being wrecked by their own powers. Can Sunset help these poor teens or will they have to learn to fend for themselves? One interesting part of the Equestria Girls section has always been how Sunset took over the leadership role. The rest of the Mane 6 appear to be lost without her and tend to panic quite a lot. I suppose they have less magical experience than their pony counterparts so this makes sense, but they really tend to pale in comparison to the others. Without Sunset and Twilight they would have given up many times over. None of them get particularly large roles here as it’s all about the 2 leaders, but they’re still around of course. I am glad we got to see their super forms again as that’s always pretty cool. As always Sunset is pretty great here. She doesn’t jump to conclusions even when the facts appear to be self evident and she makes sure everyone calms down so nobody does anything crazy. Sunset also acts as the veteran of the group and constantly gives everyone sound advice. She also doesn’t mince words or beat around the bush. You can see how she is clearly the best member here. Sunset just gives the whole group a lot of focus and determination that they wouldn’t otherwise have. That’s not a skill you can just learn. Meanwhile, this is one of Twilight’s weaker appearances I’m afraid. She spends most of the film being scared of her inner darkness. It’s a plot point that is as old as time and it’s certainly not bad to be afraid. That being said, she just gets less time to really look good as a result. At least this film does mainly dodge the romance angle that plagued the last few films. Trust me, that’s a subplot that you will be glad is gone. It didn’t actually add anything to the story. Granted, we did get some minor tricky moments with Timber, but fortunately they weren’t occurring often. I’ll give the film credit for giving us a proper climax. The main antagonist actually gets super powers which I was not expecting to see. That was pretty cool. We also did get a bit of a fight towards the end or at least you could call it a skirmish. Having everyone transform into their powered up forms was just what I was hoping to see. It was a nice way to end the film and completed the experience. It makes all the difference. There were two new characters for this movie so lets quickly talk about them. One of these is Gloriosa. She runs the camp and is very enthusiastic about making it a good time for everyone. She seems nice enough and since it’s a lot of work it is good that she has a cheerful disposition. I’d say she made for a fun new character. Unfortunately, Timber is not nearly as good. The guy can be pretty annoying at times and gets too much screen time. Ultimately you never feel like he has a handle on the situation. The animation is pretty consistent as always. If you liked the animation for the previous installments then you will certainly enjoy this one as well. It’s flash style so the colors all look pretty good even if the designs don’t have that 3D depth to them. I certainly wouldn’t give the graphics a thumbs down. What is a little surprising is that this movie doesn’t have as many songs as you would expect. They are noticeably absent. I suppose MLP doesn’t always have to break out the songs but you’ll have come to expect them after a while. The soundtrack isn’t bad, but you just feel like you are missing something without them. Overall, This is a pretty good Equestria Girls installment. The change of locale is pretty fun. A forest is about as different from a school as you can get right? The movie plays out like an extended episode would and it works smoothly. You have your main story, problem, and then resolution. It all ties together pretty well. There may not be a lot of stakes this time around, but the references to the previous film do remind you that the supernatural enemies could be around any corner. I’d recommend checking this film out. The writing is on point and it’s an enjoyable experience. I do hope that down the road we can see the Mane 6 contribute a bit more though. Don’t get me wrong, Sunset can handle her own movies just fine, but the old guard should at least get something to do other than watch during all of the crucial moments. 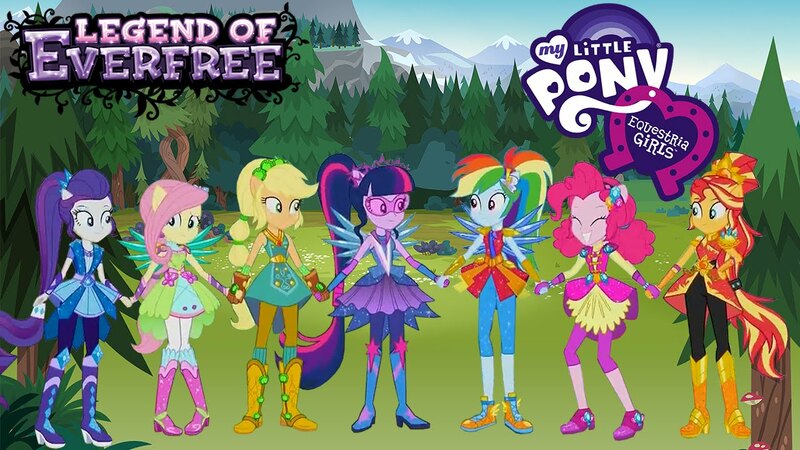 This entry was posted in Animated Movie Reviews, Animated Movies, Reviews and tagged Equestria Girls, Equestria Girls: Everfree Forest, Everfree Forest, Film Review, Hasbro, Legend of Everfree, MLP, Movie Review, My Little Pony, Review, Sequel by dreager1. Bookmark the permalink.